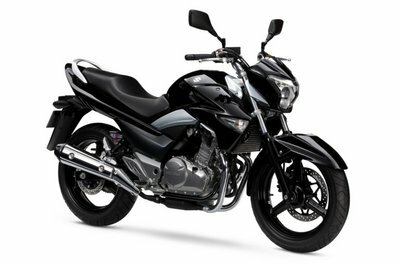 When I hear the name “Triumph,” my mind immediately goes to the old classic styles, or the new bikes made to look like the old classic style, and always within cruiser/standard bracket. 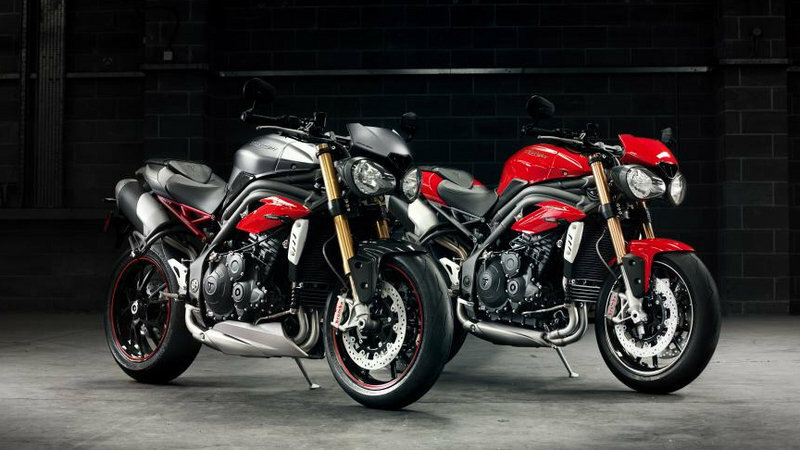 Given the long history of cruiser and Western-style performance bikes, it’s easy to forget that Trumpet has been making performance streetfighters in more of an Italian or Japanese style in the form of its Speed Triple family. 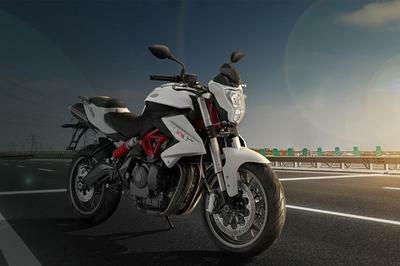 The name is a reference to the old Speed Twin, and the Triple family tree has grown through a few branches to bring us to the almost all-new-for-2016 Speed Triple S and Speed Triple R.
As more and more Western riders — Americans specifically — become more aware and covetous of performance road machines from someone other than the Big Four in Japan, I expect this family will make a suitable candidate if your short list includes some of the streetfighters from Beemer, MV Agusta, KTM, Ducati and the like. Join me while I check out the new stuff Trumpet has in store for us this year. Continue reading for my review of the Triumph Speed Triple S and Speed Triple R.
The Speed Triple family was one of the original “hooligan bikes,”, so it predictably falls into the nearly-naked category with minimal body panels and exposed framing with the engine clearly visible and nothing at all left to the imagination. In this case, it’s not just looks at stake but performance as well, so Trumpet kept weight to a minimum with tiny front turn-signal standoffs, a minimal flyscreen up front and on the “R” model, carbon-fiber fenders. A tucked-in, dual exhaust system carries away waste gasses without impacting the flow of the lines or sticking out in a vulnerable position where it will be damaged if dropped. Lean and aggressive, the stance looks like a sprinter crouched at the blocks with an unmistakable “time-to-go” attitude. The seat-to-foot relationship places the legs in the jockey position, and the short, billet-aluminum risers and nearly flat bars naturally pull the rider forward into a racer position. Folks with really long arms might be able to sit upright in the saddle, but most of us with be in a forward-leaning position to some degree, nothing for it. The “R” model comes with saddle stitching in the same tell-tale red as the rim accent stripes. The flyscreen and twin, symmetrical headlamps give the front end an almost alien, even bug-like look, but it is clean and nothing is wasted on an overblown front fairing or shrouds. Like I said; lean and clean. DRL (daytime running lights) make for an extra, safety-related feature that’s new for this year. I know they increase visibility from the front, but I don’t see how that’s better than just burning the headlight. Just sayin’. A lightweight, twin-spar, aluminum frame starts the Speed family off in the right direction with distinct, and distinctly visible, members up high and a stressed-engine arrangement to complete the circuit down low for a strong but not overly weighty skeleton. Size and frame geometry reflect the designed use of the family. The 56.5-inch wheelbase keeps things nice and tight, while the sharp, 22.9-inch rake angle and short 3.6-inch trail allow for rapid flicks and reversals in the corners. All-in-all set up as a very nimble machine. 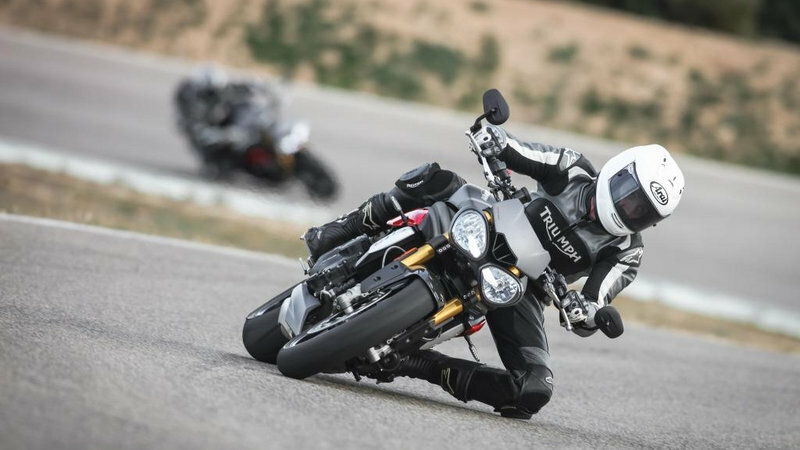 At the suspension, we notice one of the few differences between the new Speed Triple siblings. While there is no doubt the 43 mm, usd, Showa forks and Showa Monoshock, both with adjustable compression and rebound damping provide a sporty ride for the “S” with nearly all the adjustments one would expect, the “R” takes it a step further. Öhlins provides front and rear suspension for the “R” with 43 mm, NIX30, usd forks and a TTX36, twin-tube monoshock, both of which also come with adjustable rebound and compression values. No matter which suspension type you get, you wind up with 4.72 inches of travel up front and 5.11 inches in back. Wheel-speed sensors read rotation and feed data to the ABS and traction control systems. 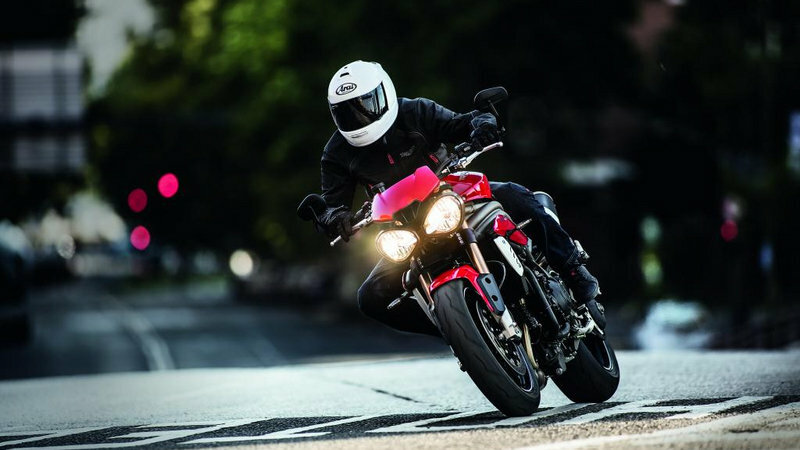 In turn, the three-mode ABS works with the Brembo calipers to prevent loss of traction due to overbraking or poor riding conditions. Dual, 320 mm front discs and a 255 mm rear disc work with the four-pot, Monobloc calipers up front and twin-pot clamp in the back. 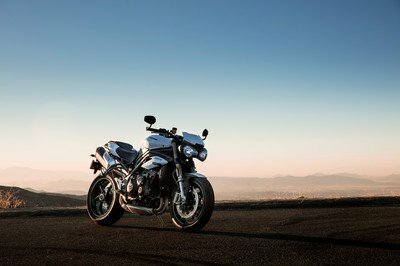 Triumph made some serious revisions to the water-cooled, 1,050 cc, Speed Triple family engine. The factory made adjustments to the crankshaft as well as the pistons and combustion chamber for a whole new internal design for 2016. The new four-valve heads come ported for increased flow, and a revamped air box and exhaust-header design opens up the circuit to allow the engine to breathe more freely. A ride-by-wire throttle and electronic engine management serves to control the induction and provide seamless transitions while enabling the Rider Mode feature. This gives a choice between four preset levels of intervention with a fifth slot for a custom, rider-programmed setup. If you are complacent (read: lazy) like me, one of the four presets will do for my traction-intervention needs, but for you real scientific riders out there, Triumph leaves you a little sandbox in which to play. The larger playground that everyone can enjoy is revealed by the performance numbers. At 7,850 rpm, the torque maxes out with 82.6 pounds of grunt. Wind it out to 9,500 rpm and you unleash the 140 ponies. Keep in mind this is on a 450-pound bike fully fueled, and this is where the “Speed” Triple family lives up to its name. 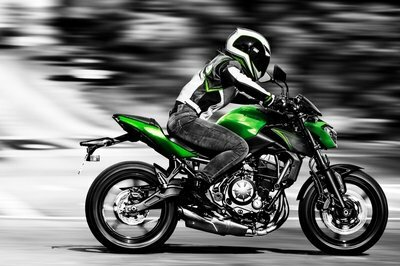 The lump drives the bike up to around 150 mph, give or take, and though actual off-the-floor racetrack performance may not be quite up to some of the other big-name competitors, street performance is really way beyond what you can safely, or legally, use 99-percent of the time. A six-speed transmasher rations out the power to the rear wheel via the X-ring chain that serves as the final drive, and I’m fine with that, ’cause there is still nothing more appropriate for performance applications, says I. 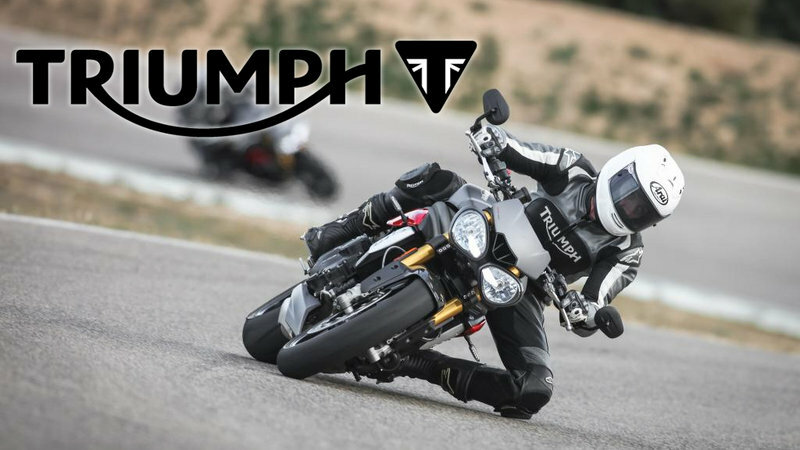 Triumph adds a final layer of traction-integrity protection with a hydraulic slip-and-assist clutch that reduces effort at the clutch lever, yay for that, and prevents excessive back-torque from causing wheel hop during aggressive, speed-scrubbing downshifts. With so many streetfighters to choose from, I decided that a European foe might be more appropriate than a Japanese one. 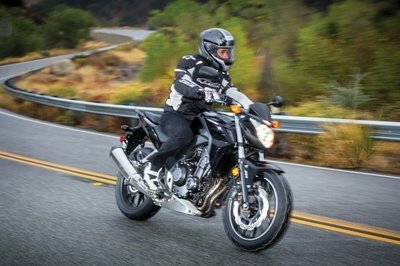 With that in mind, I decided on a KTM product that, while it’s not a direct racetrack competitor, it is likely to appeal to buyers considering something from the Speed Triple family: the 1290 Super Duke R.
I mentioned already that they aren’t quite apples-to-apples, so let’s go ahead and address the obvious difference: engine size. 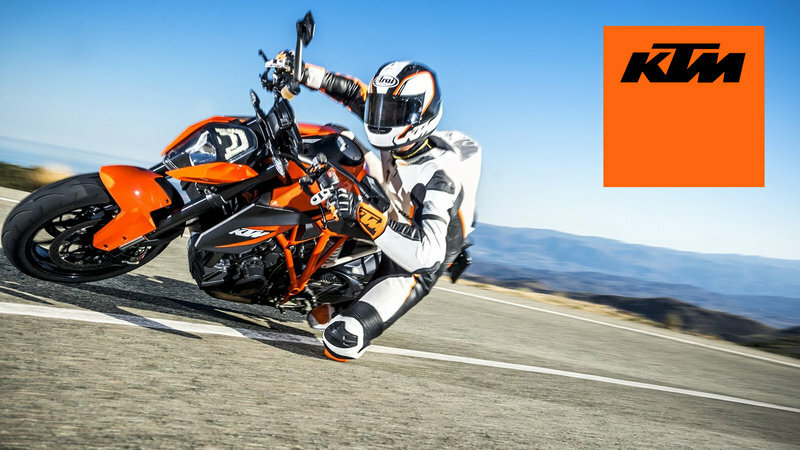 At 1,050 cc, the Speed Triple bikes engines qualify for superbike status in displacement, but the water-cooled, twin-cylinder KTM displaces a total of 1,301 cc for a difference you can feel below the belt. A whopping 172.6 ponies comes on at the top end, placing it well in front of the Triumph. This is all well and good, but since the situations where you can get away with using a Speed Triple to its full potential are few and far between, the off-track performance of the KTM is hardly of any benefit. Looks-wise, they both fall into the naked streetfighter, or “hooligan bike” category with an aggressive stance and forward-leaning riding posture. Minimal body panels leave the engine exposed for easy maintenance and jealous glances. Both competitors run ABS with Brembo brakes and some sort of traction control, so there is really little to choose between the two in the gadget department. KTM takes a hit at the till, however. While the revised Speed Triple S starts at $13,200 and the R starts at $14,900, it take a little more cheddar to lure the Super Duke off the porch. MSRP on last year’s Super Duke was $16,999 and I doubt this year will be much cheaper, if any, and this represents a significant margin. They say you get what you pay for, but in my opinion, for off-track use, you get enough with the Trumpet. And the on-track guys? Well, they aren’t exactly coming to me for advice on their next ride.